A great blue jacket, designed with cloth from Dugdale Bros, complemented by a crisp shirt, using shirting cloth from Acorn Fabrics. Although the jacket is only at its baste fitting stage, we can already see emerging the elegant effect that such a combination of colour, cut and style can offer. See also: acorn, Bespoke Shirts, Bespoke Suits, cloth, dugdale, Fabrics, Henry Herbert Tailors, Jacket, Savile Row Suits, savile row tailor, Sports Jacket, Tailored Suits, Visiting Tailor, Visiting Tailor Service, wedding suits. Blue Sports Jacket with an Open Cream Shirt - by Henry Herbert Tailors. 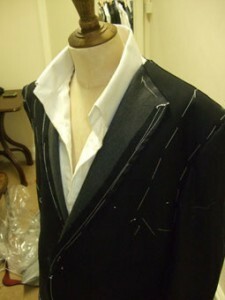 A blue sports jacket complemented by a crisp shirt worn open at the neck.